A not at all hot, but very fragrantly spicy vegetable tagine. Lets hope that The Bandit and Octavia’s Daughter like it. If they don’t, their warm jackets and car keys are just to hand. Black beans and sweet potato seem to like each other. The orange of the potato seems brightened against the black backdrop of the beans, while their flavours and consistencies are complementary. This is a very simple dish to make – say 15 minutes preparation time, and then between 45 and 60 minutes to bake. Put the oven on to preheat while you prepare everything else, and it will speed cooking time significantly if you place the empty tagine in the oven as it preheats. While the tagine heats up The VegHead meanwhile lumps all the ingredients into a bowl, which I then just empty into the tagine when ready. Arrange the courgette and sweet potato slices spoke-like around the top of the tagine, with the skin facing upward. Arrange the tomato slices between the spokes. Beetroot is a misunderstood thing. Gorgeously purple. and almost the entire plant is edible….but more on that at another time. Seeing as today we had potatoes at lunchtime (see “Roast Potato and Onion Soup) then it seemed too-much-of-a-good-thing to have a starchy vegetable at dinner time. Hence…beetroot. 1 small onion. Thinly sliced. 1 clove of garlic. Chopped. 2 teaspoons of ground pepper. 2 tablespoons of light tahini. 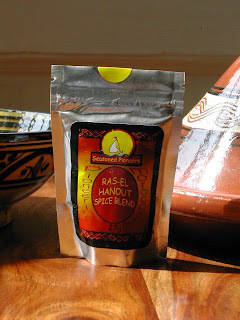 Combine all ingredients except for the sesame oil into a tagine. If you don’t have a tagine then use any covered baking tray that is about 30cms in diameter. 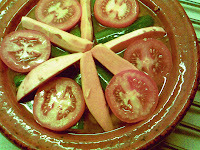 Add water until the level is about 1cm below the edge of your tagine. Nice with couscous (or other grain), or some steamed vegetables.